The Rainbow Classroom spans an exciting and important stage in children's development, one in which we see a tremendous amount of growth and change. Our classroom is a mix of three- and four-year olds, and we seek to build upon the relationships established in past classrooms. Our sense of community really becomes established at this stage as children and families have spent a year or two to grow together. 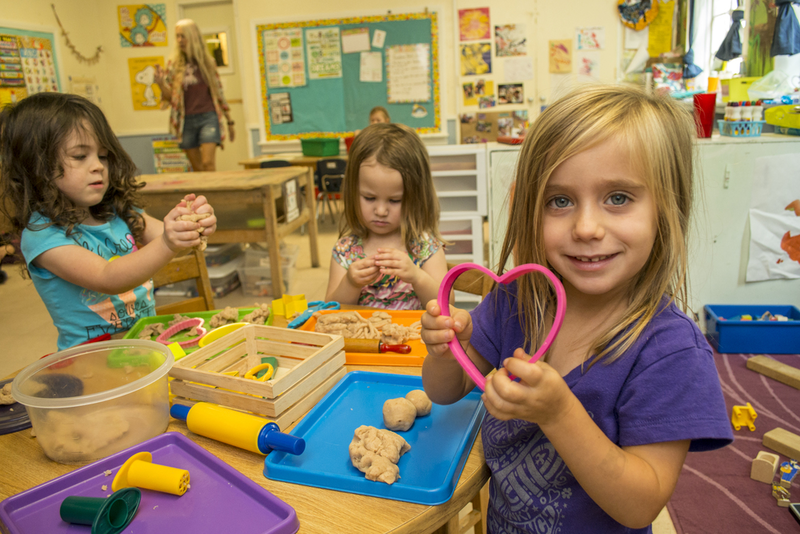 Through our integrated and emergent curriculum we help children work on age-appropriate and relevant goals in the areas of social, emotional, cognitive, and physical development. Each part of our day is rich with hands-on opportunities to explore materials and make discoveries. Rainbows are encouraged to be creative, independent learners and have daily opportunities to choose activities according to their own varying interests. There is an incredible sense of pride and accomplishment in the Rainbow room as children master new tasks and learn new skills. Literacy is one of the many areas in which children this age are beginning to blossom, and you will see that our classroom is rich in child dictation. This allows their words to take life and reinforces the concept that words are an important and powerful means of communication. The Rainbows consist of children approximately 3 years old as of September 1st. There is a student teacher ratio of 16 to 2.